Our iconic Crescent family of stools acquires a new member with the arrival of the Brushed Crescent Stool Black. As the name suggests, this trendsetting design comes in beautiful brushed steel, offering an elegant alternative to chrome for those who want something a little different. Upholstered in chic black faux leather, the seat is padded for the utmost comfort and is aided by the integrated backrest that arches from one side of the seat to the other in true Crescent fashion. 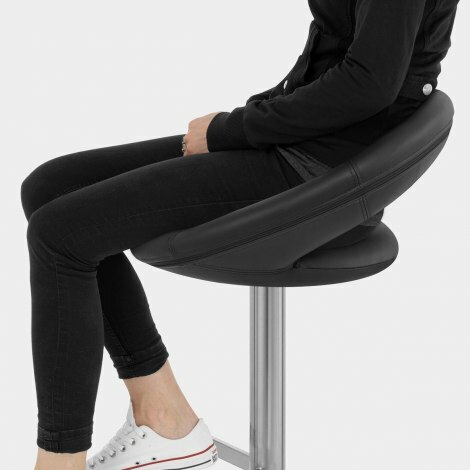 The backrest is also padded and gives good support for the lower and mid lumbar regions of the back. The brushed steel central column frame below lends a sleek contemporary look, with a matching footrest and round base for a quality and upmarket feel. Function is on par with fashion thanks to a hydraulic column within that can alter the height of the seat, as well as allowing 360-degree rotation. Last but not least, the Crescent includes a rubber floor guard beneath the base, giving added grip whilst protecting flooring from any scratches or scrapes. "Excellent product, very sturdy and very comfortable"
Lovely stylish stools really fit in well with my deco. Brushed chrome base make them look very expensive. Very nice good quality & love the brushed chrome finish. Easy to put together, nice black seat with good Imatation leather, does not look plasticy with zip all around seat. Bought In sale so good value. They will look very classy in my new kitchen, which is being fitted soon! Now been a few months of being used and just like new. They are just what I wanted. I purchased 4 stools for my newly refurbished kitchen. 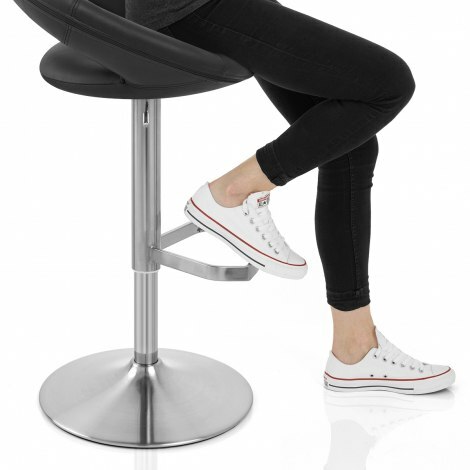 Absolutely fantastic, stylish and super comfy bar stools. Would highly recommend.!! Bought them at a reduced price which was a bonus.